Chop potatoes into small cubes. In a medium bowl toss potatoes with coconut oil, Italian seasoning, salt, garlic, and cayenne pepper. Spread evenly on a large jelly roll pan or baking dish and bake until golden brown, about 25 minutes. Mix almond and coconut flour with the salt, then slowly fold in softened butter until it crumbles. Stir in water by the tablespoon and mix dough thoroughly by hand. Once dough is mixed, divide in half and roll into balls. Cover or wrap balls and put in fridge. Preheat oven to 425 degrees ºF. Saute onions in coconut oil until they become translucent. Heat vegetable broth in a medium pot and bring to a boil. Once boiling add cumin and lower head to medium. Add coconut cream concentrate. Add vegetables to mixture and let simmer 15 minutes stirring frequently. While mixture is simmering take 1/2 the dough and push down into the dish fairly thin and up the sides covering the dish. Roll out remaining dough to cover top and set aside. Fill the dish with rolled out dough making sure to fill any cracks. Once mixture has simmered and dough is rolled out add coconut flour to mixture to thicken the liquid. Pour mixture into dish. Take rolled top and lay over dish. If some cracks or falls apart that’s ok just press it back together and fill in cracks. Press edges together. Place in oven for 20-30 minutes or until dough is golden brown around edges. If you want to make this recipe completely vegan just substitute earth balance for butter. Also coconut oil may work, but I haven’t tried it yet. I use frozen broccoli florets and frozen peas to save time and it turns out great. 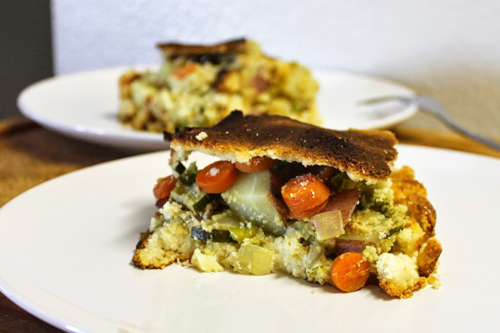 Sara from Austin, TX just won $50 for this recipe and photo! Submit yours here. In a large skillet, sautÃ© potatoes in oil. 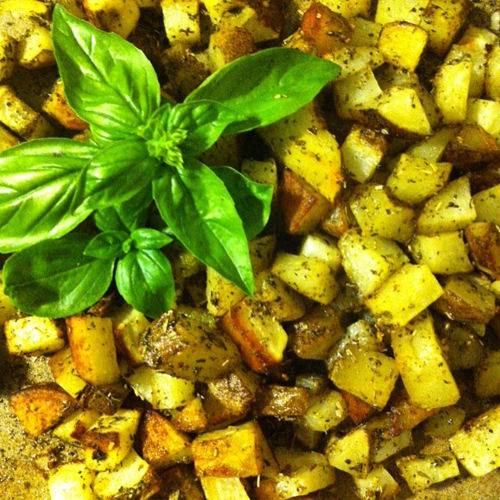 Sprinkle garlic and seasonings over potatoes and stir until combined. SautÃ© for about 15 minutes over low-medium heat or until potatoes are cooked through. The smaller the potato pieces, the faster the dish will cook. Preheat oven to 350 degrees ÂºF. 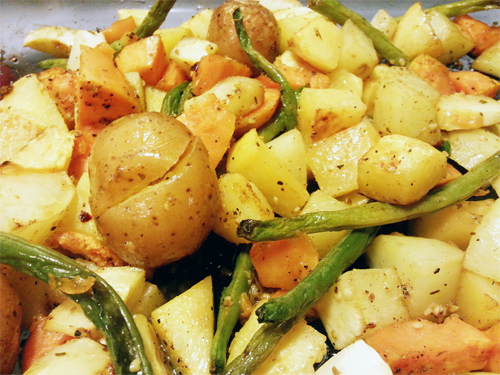 In a large casserole dish, combine clean, cut vegetables. Drizzle with coconut oil and stir until vegetables are coated in oil. Add thyme, garlic, salt, pepper and pepper flakes. Stir again until vegetables are coated with seasonings. Pour water over vegetables. Bake in preheated oven for about an hour or until vegetables are cooked through and have a nice little roasted crisp to them. Mix and add to bowl or plate big enough to use. Set aside. Combine all the ingredients from the potato mixture and mix well; you want almost the consistency of play dough. If still to sticky or wet mix in more flour 1/4 a cup at a time. Heat shortening in a large skillet. Shape a small amount of potato mixture to form a small ball and then smash it out flat – 1/4 to 1/2 inch thick, making it about the size of a cut tomato slice around. With step 1 flour coating, and lightly coat potato cake and dunk in milk mixture, making sure to do this step fast but getting both sides wet. Add potato cake to step 3 flour coating and press both sides into mixture making sure to cover well. Add to hot palm Shortening to cook (depending on your stove you might need to cook on med, med/hi or hi) Make sure oils not to hot that it burns, you want the first side golden brown in about 2 to 3 minutes. then flip & cook another minute to 3 minutes, potato cakes are done when they float, we simply add them to a cookie sheet sideways as pictured. 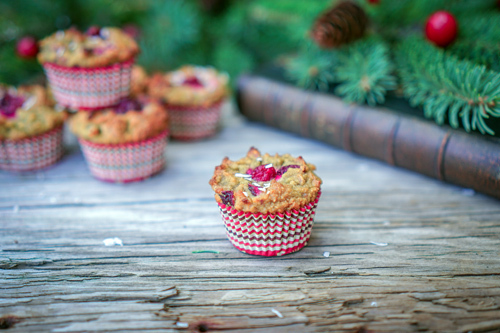 *Flour recommendations: whole wheat, einkorn, or gluten free flour mixture. 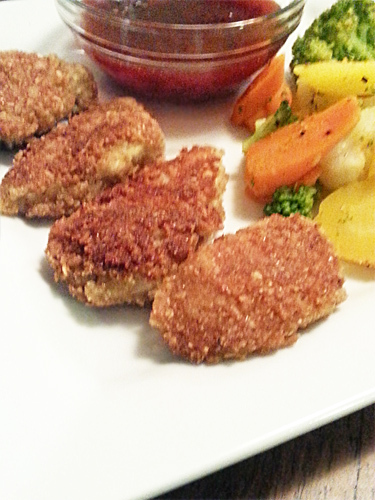 Cheree from Allons, TN just won $50 for this recipe and photo! Submit yours here. In a bowl, combine milk and lemon juice. Add chicken strips into milk mixture and let sit for a few minutes. In a separate bowl, combine remaining ingredients and mix well. 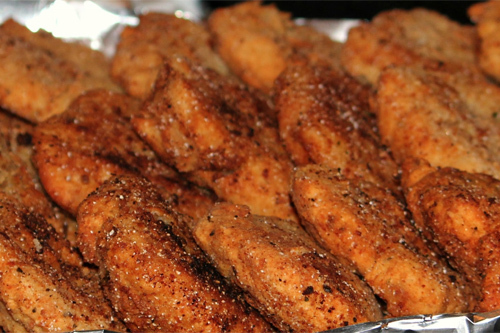 Gently coat each chicken strip in dry mixture and place in a skillet to fry or on a greased baking sheet. Pan fry in olive or coconut oil or bake at 400 Â°F for about 20 minutes (turning halfway through) or until chicken is cooked through. While chicken is baking, place sauce ingredients in a small blender. Blend until smooth and pour into a saucepan. Bring mixture to boil, stirring constantly and cook for about 10 minutes. Remove from heat and let sit for a few minutes before serving with chicken strips. Preheat oven to 325 degrees ÂºF. Grease a 12 cup muffin tin. Stir all dry ingredients together. If using honey as a sweetener, mix it with the wet ingredients. In a separate large bowl, stir together the wet ingredients and then mix them into the dry ingredients thoroughly. Spoon the batter into the muffin cups. 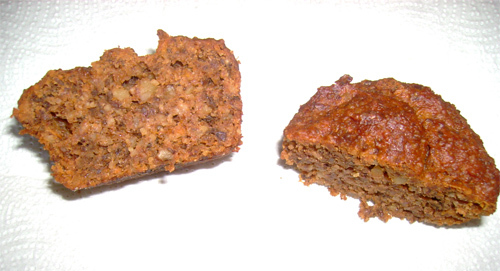 Bake for approximately 45 minutes or until a toothpick inserted comes out dry. Cool muffins in pan for 10-15 minutes before removing. Place on a rack to finish cooling. 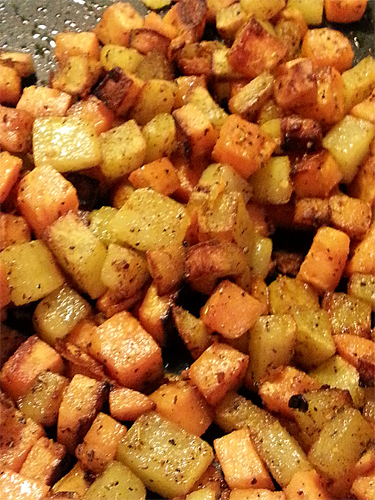 Sharla from Boise, ID just won $50 for this recipe and photo! Submit yours here.